Former Attorney General Jody-Wilson Raybould is telling her side of the story for the first time since the SNC-Lavalin affair sent Parliament Hill into a frenzy nearly three weeks ago. Read a complete transcript of her testimony. 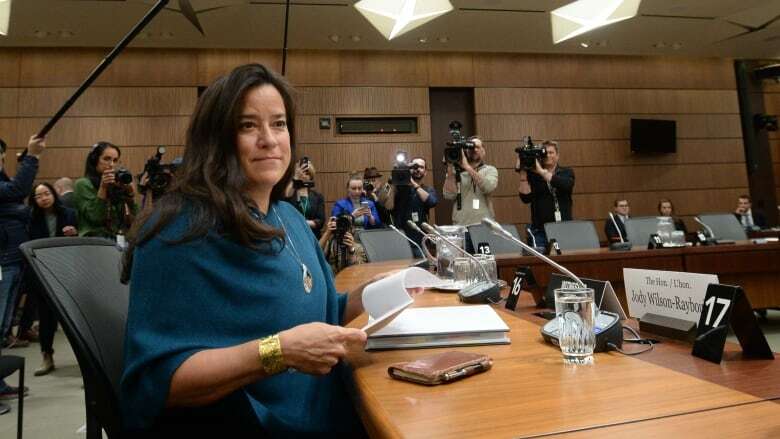 Former justice minister and attorney general Jody Wilson-Raybould presented her side of the story for the first time since the SNC-Lavalin affair sent Parliament Hill into a frenzy nearly three weeks ago. The Liberal MP addressed the House of Commons justice committee investigating allegations of political interference in the handling of prosecution of the Montreal-based engineering and construction giant. Thank you Mr. Chair and thank you to the members of the justice committee for providing me the opportunity for extended testimony today. I very much appreciate it. For a period of approximately four months between September and December 2018, I experienced a consistent and sustained effort by many people within the government to seek to politically interfere in the exercise of prosecutorial discretion in my role as the attorney general of Canada in an inappropriate effort to secure a deferred prosecution agreement (DPA) with SNC-Lavalin. These events involved 11 people (excluding myself and my political staff) from the Prime Minister's Office, the Privy Council Office and the office of the minister of Finance. This included in-person conversations, telephone calls, emails, and text messages. There were approximately 10 phone calls and 10 meetings specifically about SNC-Lavalin. And I and/or my staff were a part of these meetings. Within these conversations, there were express statements regarding the necessity of interference in the SNC-Lavalin matter, the potential of consequences and veiled threats if a DPA was not made available to SNC. These conversations culminated in Dec. 19, 2018, with a conversation I had with the clerk of the Privy Council, a conversation that I will provide some significant detail on. A few weeks later, on Jan. 7, 2019, I was informed by the prime minister that I was being shuffled out of the role of minister of Justice and the attorney general of Canada. For most of these conversations, I made contemporaneous, detailed notes, in addition to my clear memory, which I am relying on today among other documentation. My goal in my testimony is to outline the details of these communications for the committee, and indeed all Canadians. However, before doing that, let me make a couple comments. First, I want to thank Canadians for their patience since this Feb. 7 story broke in the Globe and Mail. Thank you as well specifically to those who reached out to me from across the country. I appreciate the messages and I have read all of them. Secondly, on the role of the attorney general – the attorney general exercises prosecutorial discretion as provided for under the Director of Public Prosecutions Act. Generally, this authority is exercised by the director of public prosecutions, but the attorney general has the authority to issue directives to the DPP on specific prosecutions or to take over prosecutions. It is well-established that the attorney general exercises prosecutorial discretion. She or he does so individually and independently. These are not cabinet decisions. I will say that it is appropriate for cabinet colleagues to draw to the attorney general attention what they see as important policy considerations that are relevant to decisions about how a prosecution will proceed. What is not appropriate is pressing the attorney general on matters that she or he cannot take into account, such as partisan political considerations; continuing to urge the attorney general to take her or his mind for months after the decision has been made; or suggesting that a collision with the prime minister on these matters should be avoided. With that said, the remainder of my testimony will be a detailed and factual delineation of the approximately 10 phone calls, 10 in-person meetings, and emails and text messages that were part of an effort to politically interfere regarding the SNC matter for the purposes of securing a deferred prosecution. The story begins on Sept. 4, 2018. My chief of staff and I were overseas when I was sent a memorandum for the attorney general pursuant to section 13 of the Director of Public Prosecutions Act which was entitled "Whether to issue an invitation to negotiate a remediation agreement to SNC-Lavalin," which was prepared by the Director of Public Prosecutions, Kathleen Roussel. The only parts of this note that I will disclose are as follows: "the DPP is of the view that an invitation to negotiate will not be made in this case and that no announcement will be made by the PPSC." As with all section 13 notices – the director provides the information so that the attorney general may take such course of action as they deem appropriate. In other words, the director had made her decision to not negotiate a remediation agreement with SNC-Lavalin. I subsequently spoke to my minister's office staff about this decision and I did the standard practice of undertaking further internal work and due diligence in relation to this note, a practice that I had for many of the section 13 notices that I received when I was the attorney general. In other words, I immediately put in motion, within my department and minister's office, a careful consideration and study of the matter. Two days later, on Sept. 6, one of the first communications about the DPA was received from outside our department. Ben Chin, [Finance] Minister [Bill] Morneau's chief of staff, emailed my chief of staff and they arranged to talk. He wanted to talk about SNC and what we could do, if anything, to address this. He said to her, my chief, that if they don't get a DPA, they will leave Montreal, and it's the Quebec election right now, so we can't have that happen. He said that they have a big meeting coming up on Tuesday and that this bad news may go public. This same day my chief of staff exchanged some emails with my minister's office staff about this, who advised her that the deputy attorney general – Nathalie Drouin – was working on something and that my staff were drafting a memo as well on the role of the attorney general vis à vis the PPSC. It was on or about this day that I requested a one-on-one meeting with the prime minister on another matter of urgency – and as soon as possible after I got back into the country. This request would ultimately become the meeting on Sept. 17 between myself and the prime minister that has been widely reported in the media. On Sept. 7, my chief of staff spoke by phone to my then deputy minister about the call she had received from Ben Chin and the deputy stated that the department was working on this. The deputy gave my chief a quick rundown of what she thought some options would be. On the same day I received a note from my staff – on the role of the attorney general – a note that my office also shared with Elder Marques and Amy Archer at the PMO. Same day, staff in my office met with the deputy minister. Some excerpts of the section 13 note were read to the deputy minister, but the deputy minister did not want to be provided with a copy of the section 13 note. Sept. 8, my deputy shared a draft note on the role of the attorney general with my chief of staff who subsequently shared it with me, and over the next day clarity was sought by my staff with the deputy on aspects of the options that were laid in her note. A follow-up conversation between Ben Chin and a member of my staff occurred on Sept. 11. Mr. Chin said that SNC had been informed by the PPSC that it cannot enter into a DPA – and Ben again detailed the reasons why they were told they were not getting a DPA. Mr. Chin also noted that SNC's legal counsel [was] Frank Iacobucci, and further detailed what the terms were that SNC was prepared to agree to – stating that they viewed this as a negotiation. To be clear, up to this point I had not been directly contacted by the prime minister, officials in the Prime Minister's Office, or the Privy Council's Office about this matter. With the exception of Mr. Chin's discussions, the focus of communications had been internal to the Department of Justice. This changes on Sept. 16. My chief of staff had a phone call with Mathieu Bouchard and Elder Marques from the Prime Ministers' Office. They wanted to discuss SNC. They told her that SNC had made further submissions to the Crown, and "there is some softening, but not much." They said that they understand that the individual Crown prosecutor wants to negotiate an agreement, but the director does not. They said that they understand that they can't direct, but that they hear that our deputy minister (of Justice) thinks we can get the PPSC to say "we think we should get some outside advice on this." They said that they think we should be able to find a more reasonable resolution here. They told her that SNC's next board meeting is on Thursday (which was Sept. 20). They also mention the Quebec election context. They asked my chief if someone has suggested the outside advice idea to the PPSC, and asked whether we are open to this suggestion. They wanted to know if the deputy could do it. In response, my chief of staff stressed to them prosecutorial independence and potential concerns about interference in the independence of the prosecutorial functions. Mr. Bouchard and Mr. Marques kept telling her that they didn't want to cross any lines — but they asked my chief of staff to follow up with me directly on this matter. To be clear, I was fully aware of the conversations between Sept. 4 and 16 that I have outlined. I had been regularly briefed by my staff from the moment this matter first arose, and I had also reviewed all materials that had been produced. Further, my view had also formed at this point, through the work of my department, my minister's office and I had conducted, that it was inappropriate for me to intervene in the decision of the Director of Public Prosecutions in this case and to pursue a deferred prosecution agreement. In the course of reaching this view, I discussed the matter on a number of occasions with my then deputy so that she was aware of my view, raised concerns on a number of occasions with my deputy minister about the appropriateness of communications we were receiving from outside the department, and also raised concerns about some of the options she had been suggesting. On Sept. 17, the deputy minister said that Finance had told her that they want to make sure that [Director of Public Prosecutions] Kathleen [Roussel] understands the impact if we do nothing in this case. Given the many potential concerns raised by this conversation, I discussed this with her later with my deputy. This same day (Sept. 17) I have my one-on-one with the prime minister that I requested a couple weeks ago. When I walked in the clerk of the Privy Council was in attendance as well. While the meeting was not about the issue of SNC and DPAs, the prime minister raised the issue immediately. The prime minister asks me to help out – to find a solution here for SNC – citing that if there was no DPA there would be many jobs lost and that SNC would move from Montreal. In response, I explained to him the law and what I have the ability to do and not do under the Director of Public Prosecutions Act around issuing directives or assuming conduct of prosecutions. I told him that I had done my due diligence and made up my mind on SNC and that I was not going to interfere with the decision of the director. In response, the prime minister further reiterated his concerns. I then explained how this came about and that I had received the section 13 note from the DPP earlier in September and that I had considered the matter very closely. I further stated that I was very clear on my role as the attorney general and that I am not prepared to issue a directive in this case – that it was not appropriate. The prime minister again cited potential loss of jobs and SNC moving. Then to my surprise – the clerk started to make the case for the need to have a DPA. He said "there is a board meeting on Thursday (Sept. 20) with stock holders … they will likely be moving to London if this happens and there is an election in Quebec soon." At that point the prime minister jumped in stressing that there is an election in Quebec and that "I am an MP in Quebec – the member for Papineau." I was quite taken aback. My response – and I remember this vividly as well – was to ask the prime minister a direct question while looking him in the eye. I asked: "Are you politically interfering with my role, my decision as the attorney general? I would strongly advise against it." The prime minister said, "No, no, no – we just need to find a solution." The clerk then said that he spoke to my deputy and she said that I could speak to the director. I responded by saying no I would not – that would be inappropriate. I further explained to the clerk and the prime minister that I had a conversation with my deputy about options and what my position was on the matter. As a result, I agreed to and undertook to the prime minister that I would have a further conversation with my deputy and the clerk. But that these 10 conversations would not change my mind. I also said that my staff and my officials are not authorized to speak to the PPSC and then we finally discussed the issue I had asked for the meeting in the first place. I left meeting and immediately debriefed with my staff as to what was said with respect to SNC and DPAs. On Sept. 19, I met with the clerk as I had undertaken to the prime minister. The meeting was one-on-one, in my office. The clerk brought up job losses and that this is not about the Quebec election or the prime minister being a Montreal MP. He said that he has not seen the section 13 note. He said that he understands that SNC is going back and forth with the DPP, and that they want more information. He said that "[SNC counsel Frank] Iacobucci is not a shrinking violet." He referenced the Sept. 20 date and that they don't have anything from the DPP. He said that the prime minister is very concerned about the confines of my role as attorney general and the Director of Public Prosecutions. He reported that the prime minister is very aware of my role as the attorney general. I told the clerk again that I had instructed that my deputy is not to get in touch with the director and that given my review of the matter I would not speak to her directly regarding a DPA. I offered to the clerk that if SNC were to send a letter to me expressing their concerns – their public interest argument – it would be permissible and I would appropriately forward it directly to the director of public prosecutions. Later that day my chief of staff had a phone call with Elder Marques and Mathieu Bouchard from the Prime Minister's Office. They wanted an update on what was going on regarding DPAs since "we don't have a ton of time." She relayed my summary of meeting with clerk and the prime minister. Mathieu and Elder raised the idea of an "informal reach out" to the DPP. My chief of staff said that she knew I was not comfortable with it, as it looked like and probably did constitute political interference. They asked whether that was true, if it wasn't the attorney general herself, but if it was her staff or the deputy minister, my chief of staff said yes it would and offered a call directly with me. They said that "we will regroup and get back to you on that." Still on Sept. 19, I spoke to Minister Morneau on this matter when we were in the House. He again stressed the need to save jobs, and I told him that engangments from his office to mine on SNC had to stop – that they were inappropriate. On Sept. 20, my chief of staff had a phone calls with Mr. Chin and Justin To – both members of the minister of Finance's office about SNC and DPAs. At this point there was an apparent pause in communicating with myself or my chief of staff about the SNC matter. We did not hear from anyone again until Oct. 18, when Mathieu Bouchard called my chief of staff and asked that we – I – look at the option of my seeking an external legal opinion on the DPP's decision not extend an invitation to negotiate a DPA. This would become a recurring theme for sometime in messages from the PMO – that an external review should be done of the DPP's decision. The next day as well, SNC filed a Federal Court application seeking to quash the DPP's decision to not enter into a remediation agreement with them. In my view, this necessarily put to rest any notion that I might speak to or intervene with the DPP, or that an external review could take place. The matter was now before the courts, and a judge was being asked to look at the DPP's discretion. However, on Oct. 26, 2018 – when my chief of staff spoke to Mathieu Bouchard and communicated to him now that, given that SNC had now filed in Federal Court seeking to review the DPP's decision, surely we had moved past the idea of the attorney general intervening or getting an opinion on that same question. Mathieu replied that he was still interested in the external legal opinion idea. Could she not get an external legal opinion on whether the DPP had exercised their discretion properly and then on the application itself, the attorney general could intervene and seek a stay of proceedings, given that she was awaiting a legal opinion. My chief of staff said that this would obviously be perceived as interference and her boss questioning the DPP's decision. Mathieu [Bouchard] said that if – six months from the election – SNC announces they are moving their headquarters out of Canada, that is bad. He said "we can have the best policy in the world, but we need to get re-elected." He said that everyone knows that this is attorney general's decision, but that he wants to make sure that all options are being canvassed. Mathieu said that if, at the end of the day, the attorney general is not comfortable, that is fine. He just doesn't want any doors to be closed. Jessica [Prince] said that I was always happy to speak to him directly should he wish. In mid-November, PMO requested that I meet with Mathieu Bouchard and Elder Marques to discuss the matter – which I did, on Nov. 22. This meeting was quite long – I would say about an hour and a half. I was irritated by having to have this meeting as I had already told prime minister etc. that a DPA on SNC was not going to happen, that I was not going to issue a directive. Mathieu in this meeting did most of the speaking – he was trying to tell me that there were options and that we needed to find a solution. I took them through the DPP Act – section 15, section 10 – and talked about the prosecutorial independence was a constitutional principle and that they are interfering. I talked about the section 13 note – which they said they had never received – but I reminded them that we sent it to them in September. Mathieu and Elder continued to plead their case talking about if I am not sure in my decision that we could hire an eminent person to advise me. They were kicking the tires. I said no. My mind had been made up and they needed to stop. This was enough. I will briefly pause at this moment to comment on my own state of mind at this point. In my role as attorney general, I had received the decision of the DPP in September, had reviewed the matter, made a decision on what was appropriate given a DPA, and communicated that to the prime minister. I had also taken additional steps that the prime minister asked me to – such as meeting with the clerk. In my view, the communications and efforts to change my mind on this matter should have stopped. Various officials also urged me to take partisan political considerations into account – which it was clearly improper for me to do so. We either have a system that is based on the rule of law, the independence of the prosecutorial functions, and respect for those charged to use their discretion and powers in a particular way or we do not. While in our system of government policy oriented discussion amongst people at earlier points in this conversation may be appropriate, the consistent and enduring efforts even in the face of judicial proceedings on the same matter and in the face of a clear decision of the director of public prosecutions and the attorney general to continue and even intensify such efforts raises serious red flags in my view. Yet, this is what continued to happen. On Dec. 5, 2018, I met with Gerry Butts. We had both sought out the meeting. I wanted to speak about a number of things, including bringing up SNC and the barrage of people hounding me and my staff. Towards the end of our meeting, which was in the Chateau Laurier, I raised how I needed everyone to stop talking to me about SNC as I had made up my mind and the engagements were inappropriate. Gerry then took over the conversation and said how we need a solution on the SNC stuff. He said I needed to find a solution. I said no and referenced the preliminary inquiry and judicial review. I said further that I gave the clerk the only appropriate solution that could have happened and that was the letter idea that was not taken up. Gerry talked to me about how the statute was a statute passed by [former prime minister Stephen] Harper and that he does not like the law. I said something like, "that is the law we have." On Dec. 7 I received a letter from the prime minister, dated Dec. 6, attaching a letter from the CEO of SNC-Lavalin dated Oct.15. I responded to the prime minister's letter of Dec. 6, noting that the matter is before the courts, so I cannot comment on it, and that the decision re: a DPA was one for the DPP, which is independent of my office. This brings us to the final events in the chronology, and ones which signal, in my experience, the final escalation in efforts by the Prime Minister's Office to interfere in this matter. On Dec. 18, 2018, my chief of staff was urgently summoned to meet with Gerry Butts and Katie Telford to discuss SNC. They wanted to know where I — me — am at in terms of finding a solution. They told her that they felt like the issue was getting worse and that I was not doing anything. They referenced a possible call with the prime minister and the clerk the next day. MOJAG (I): So where were things left? Jessica: So unclear. I said I would of course let you know about the conversation and they said they were going to the "kick the tires" with a few people on this tonight. The clerk was waiting outside when I left. But they said that they want to set up a call between you and the prime minister and the clerk tomorrow. I said that of course you would be happy to speak to your boss. They seem quite keen on the idea of you retaining an ex SCC judge to get advice on this. Katie Telford thinks it gives us cover in the business community and the legal community, and that it would allow the prime minister to say we are doing something. She was like "if Jody is nervous, we would of course line up all kinds of people to write op-eds saying that what she is doing is proper." On Dec. 19, 2018, I was asked to have a call with the clerk – it was a fairly lengthy call and I took the call from home and I was on my own, by myself. The clerk said he was calling about DPAs/SNC. He said he wanted to pass on where the prime minister is at. He spoke about the company's board and the possibility of them selling out to somebody else, moving their headquarters and job losses. He said that the prime minister wants to be able to say that he has tried everything he can within the legitimate toolbox. The clerk said that the prime minister is quite determined, quite firm, but he wants to know why the DPA route, which Parliament provided for, isn't being used. He said "I think he is going to find a way to get it done one way or another. So, he is in that kinda mood and I wanted you to be aware of it." The clerk said he didn't know if the prime minister was planning on calling me directly or if he is thinking about getting somebody else to give him some advice, you know he does not want to do anything outside the box of what is legal or proper. He said that the prime minister wants to understand more, to give him advice on this or to give you advice on this if you want to feel more comfortable you are not doing anything inappropriate or outside the frame. I told the clerk that I was 100 per cent confident that I was doing nothing inappropriate. I, again, reiterated my confidence in where I am in on my views on SNC and the DPA have not changed – I reiterated this is a constitutional principle of prosecutorial independence. I warned the clerk in this call that we were treading on dangerous ground here. I also issued a stern warning because as the attorney general, I cannot act in a manner and the prosecution cannot act in a manner that is not objective, that isn't independent, I cannot act in a partisan way and I cannot be politically motivated. This screams of that. The clerk wondered whether anyone could speak to the director about the context around this or get her to explain her reasonings. The clerk told me that he was going to have to report back to the prime minister before he leaves. He said again that the prime minister was in a pretty firm frame of mind about this and that he was a bit worried. I asked what he was worried about. The clerk then made the comment about how it is not good for the prime minister and his attorney general to be a "loggerheads." I told the clerk that I was giving him my best advice and if he does not accept that advice then it is the prime minister's prerogative to do what he wants, but I am trying to protect the prime minister from political interference or perceived political interference or otherwise. The clerk acknowledged that, but said that the prime minister does not have the power to do what he wants… all the tools are in my hands, he said. I said that I was having thoughts of the Saturday Night Massacre – but that I was confident that I had given the prime minister my best advice to protect him and to protect the constitutional principle of prosecutorial independence. The clerk said that he was worried about a collision because the prime minister is pretty firm about this. He told me that he had seen the prime minister a few hours ago and that this is really important to him. That is essentially where the conversation ended. I did not hear from the prime minister the next day. On Jan. 7, I received a call from the prime minister and was informed I was being shuffled out of my role as minister of justice and attorney general of Canada. I will not go into details of this call, or subsequent communications about the shuffle, but I will say that I stated I believed the reason was because of the SNC matter. They denied this to be the case. On Jan. 11, 2019 – the Friday before the shuffle my former deputy minister is called by the clerk and told that the shuffle is happening, and that she will be getting a new minister. As part of this conversation, the clerk tells the deputy that one of the first conversations that the new minister will be expected to have with the prime minister will be on SNC-Lavalin. In other words, that the new minister will need to be prepared to speak to the prime minister on this file. The deputy recounts this to my chief of staff who tells me about the conversation. My narrative stops here. I must reiterate to the Committee my concern outlined in my letter to the chair yesterday. That is, Order in Council #2019-0105 addresses only my time as the attorney general of Canada and therefore does nothing to release me from any restrictions that apply to communications while I proudly served as the minister of Veterans Affairs and in relation to my resignation from that post, or my presentation to cabinet after I resigned. This time period includes communications on topics that some members of the committee have explored with other witnesses and about which there have been public statements by others. The Order in Council leaves in place the various constraints, in particular, cabinet confidence, that there are on my ability to speak freely on matters that occurred after I left the post of attorney general. Even with those constraints, I hope that through my narrative today, the committee, and everyone across the country who is listening, has a clear idea of what I experienced, and what I know of who did what, and what was communicated. I hope, and expect, the facts speak for themselves. I imagine Canadians now fully understand that in my view these events constituted pressure to intervene in a matter, and that this pressure – or political interference – to intervene was not appropriate. However, Canadians can judge this for themselves as we all now have the same frame of information. Lastly, as I have said previously, "it has always been my view that the attorney general of Canada must be non-partisan, more transparent in the principles that are the basis of decisions, and, in this respect, always willing to speak truth to power." In saying this I was reflecting what I understand to be the vital importance of the rule of law and prosecutorial independence in our democracy. My understanding of this has been shaped by some lived experiences. I am, of course, a lawyer. I was a prosecutor on the downtown eastside of Vancouver. So I come to this view as a trained professional and committed to certain values as key to our system of order. But my understanding of the rule of law has also been shaped by my experience as an Indigenous person and as an Indigenous leader. The history of Crown-Indigenous relations in this country, includes a history of the rule of law not being respected. Indeed, one of the main reasons for the urgent need for justice and reconciliation today is that in the history of our country we have not always upheld foundational values such as the rule of law in relations to Indigenous Peoples and I have seen the negative impacts for freedom, equality, and a just society this can have firsthand. So when I pledged to serve Canadians as your minister of Justice and attorney general I came to it with a deeply ingrained commitment to the rule of law and the importance of acting independently of partisan, political, and narrow interests in all matters. When we do not do that, I firmly believe, and know, we do worse as a society. I will conclude by saying this: I was taught to always be careful of what you say because you cannot take it back. I was taught to always hold true to your core values and principles and to act with integrity. These are the teachings of my parents, grandparents and my community. I come from a long line of matriarchs and I am a truth teller in accordance with the laws and traditions of our Big House. This is who I am and who I will always be.